Phantom Cardboard: Hey Bud, Let's Party! 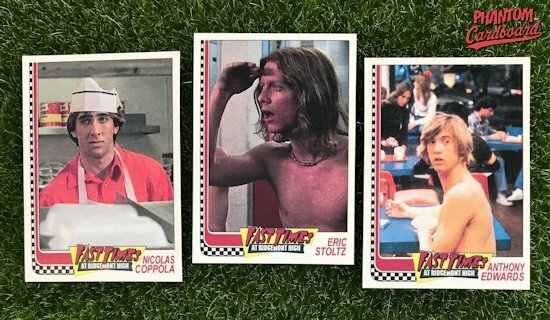 Fast Times at Ridgemont High is among the dozen or so movies that are in my top 5 favorites. 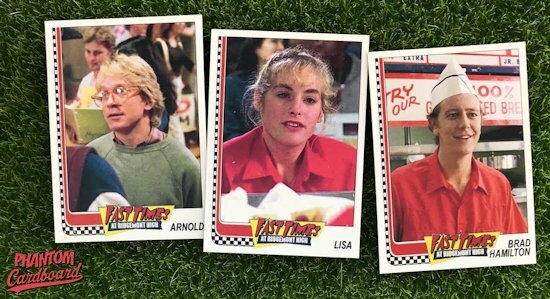 It doesn't get much more '80s than Fast Times and the cast is just loaded with Hollywood heavyweights when most were just relatively unknown up-and-comers. 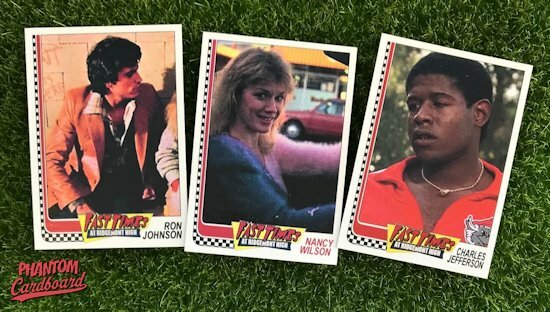 These cards are inspired by the 1982 Topps baseball set customized to give it a look that I could actually imagine the Fast Times cards having had an actual set been made. 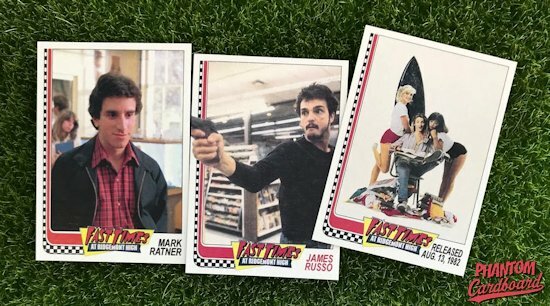 I started off with a "Mike Damone" and "Charles Jefferson" cards hoping to get autographs from Robert Romanus and Forest Whitaker. I had success with Romanus, still have my fingers crossed for Mr. Whitaker. 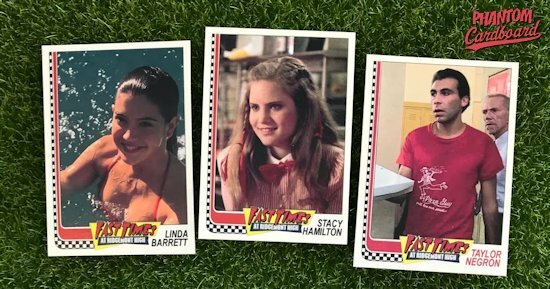 From there I would just add a cast member here and there and now it's a 20 card mini-set. The actor's whose characters had names I put in black text. 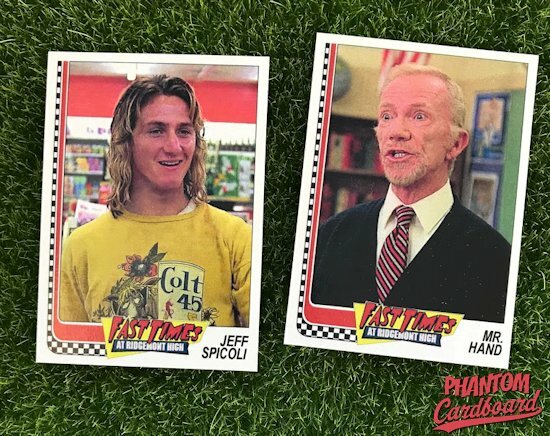 There are a number of iconic actors who played unnamed minor characters in the movie and instead of calling Eric Stoltz "Spicoli's buddy" I put his and other's actual names with the name being in red text to make the distinction. 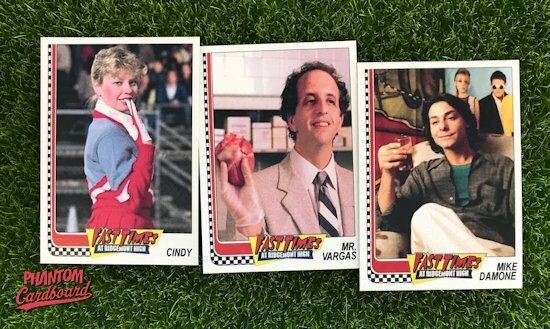 I thought that would be a particularly cool touch seeing as Nicolas Cage was billed by his real name, Nicolas Coppola, for Fast Times which was his big screen debut.